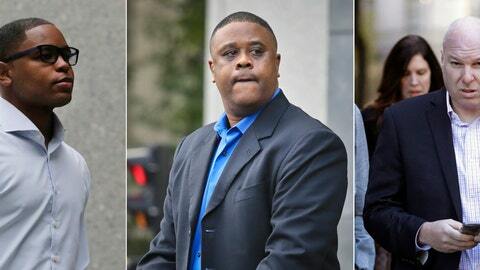 NEW YORK (AP) — Federal prosecutors have recommended multiyear prison sentences for three men convicted of fraud for channeling secret payments to the families of top-tier basketball recruits to influence where the players went to school. Former Adidas executive James Gatto, business manager Christian Dawkins and amateur league director Merl Code were convicted of conspiracy to commit wire fraud in October for funneling recruits to Louisville, Kansas and North Carolina State. On Wednesday, prosecutors in the Southern District of New York recommended a sentence of 46 to 57 months for Gatto and 30 to 37 months in prison for Code and Dawkins. They are scheduled to be sentenced next week. The schools submitted victim impact statements seeking restitutions from those convicted. Kansas asked for more than $1.1 million from Gatto and his co-conspirators. Kansas says it has “suffered considerable financial harm,” citing losses of scholarships and financial aid to athletes and legal expenses tied to the government and NCAA investigations. “The damage done by Mr. Gatto’s and his co-conspirators’ greed cannot be overstated,” university counsel William Sullivan wrote. “It impacted every employee who worked with young Brian Bowen during the summer and fall of 2017,” the school said. North Carolina State is seeking $258,585, the value of the one year of tuition for Dennis Smith Jr., who played one season at the school before being an NBA lotter pick in 2017, plus attorney’s fees.